As Toronto continues to grow, there is an increasing need and demand to revitalize existing parks and open spaces as well as to create new parks and open spaces. In order to provide this much needed open space within Toronto’s dense urban landscape, the City often negotiates with private developers to include Privately Owned Publicly-Accessible Spaces, or “POPS” for short, as part of the development application and review process. POPS are a specific type of open space which the public is welcome to enjoy, but remain privately owned. 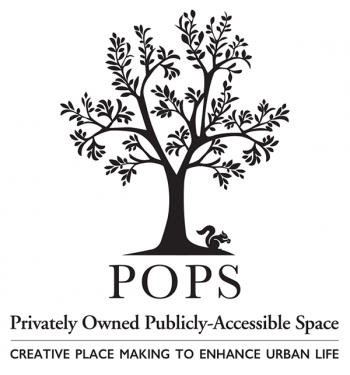 The initiative to identify the City’s POPS and create design guidelines, including a POPS signage template and logo, was a result of the November 2012 City Council Member Motion “MM28.13: Privately Owned Public Spaces (POPS): Protecting and increasing access to publicly secured open spaces” – by Councillor Josh Matlow (Ward 22 – St. Paul’s), seconded by Councillor Adam Vaughan (Ward 20 – Trinity-Spadina). On July 8, 9, 10 and 11, 2014, City Council adopted the Draft Urban Design Guidelines. The Final Report and Urban Design Guidelines are now available. POPS are a key part of the city’s public realm network, providing open space in much-needed locations across the city and complementing existing and planned parks, open spaces and natural areas. The First POPS Plaque was officially unveiled in Concord CityPlace on July 31st, 2014. Please browse the map below to locate POPS across the city. As new POPS are secured and built, locations will be added to the map. Note: POPS locations are approximate. Access to some POPS locations may be refused in certain circumstances.